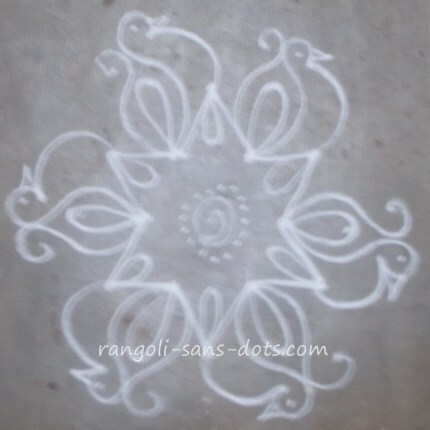 Kolams / rangoli or muggulu for apartments are usually with dots. But being primarily for rangoli without dots as the name suggests - rangoli sans dots - I would like to start designs for this category with free hand patterns. 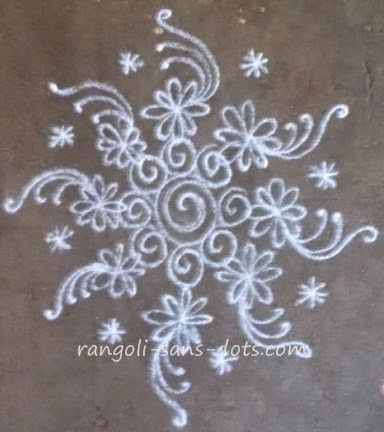 This is a collection of small rangoli designs that I draw at the entrance and as common in Rangolisansdots most of them are small and simple and suitable to be drawn at the entrance of flats or other places where space is a constraint. Lack of space should not be a constraint for us to decorate the entrance with kolam daily ! Kolam with dots are also there. 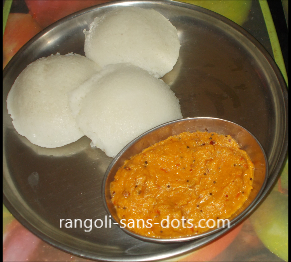 Draw it with rice flour or kolapodi to get a beautiful effect. 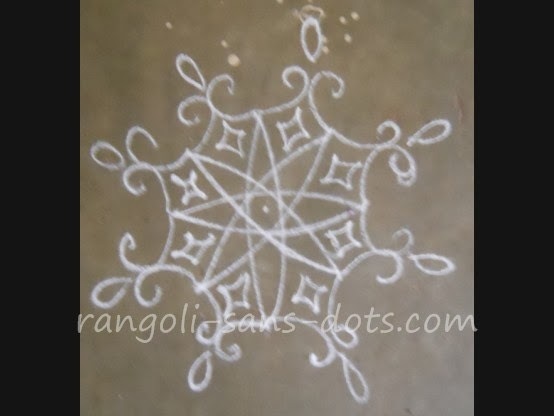 These rangolis can be catergoried as apartment kolams - the term used widely today for small and simple and easy kolams- because space is a constraint in many apartments. The image below shows a variation of common kolam ( with the central design alone ). The longer arms have been decorated with leaf patterns. The small circles inside can also be converted into small flowers or dots placed in an arc or any other decoration, let our imagination run riot in free hand kolam designs. There are no hard and fast rules. We frame the rules ( !. ) in kolam drawing . I see that there is a growing interest (among my friends, relatives, acquaintances) in Rangoli-sans-dots on It encourages me to draw many more . With God's grace I hope to continue this task. After the earlier post on apartment kolam ( loosely translated as house rangoli !) without dots since I concentrate a lot on free hand rangoli this post has been modified and updated with kolam with dots for apartments. 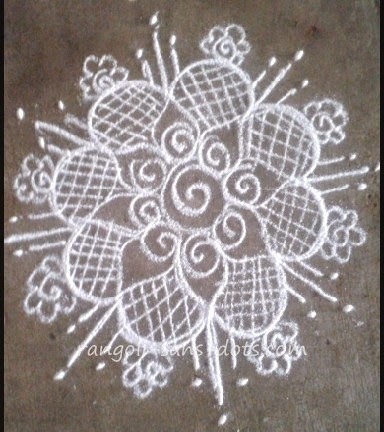 Though we use this term, it is usual to use small and cute kolam at the entrance on a daily basis without grand colours. This is the normal practice in Tamil Nadu. Hence a collection of kolam in black and white has been categorised under this heading. 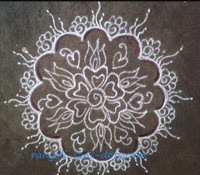 Rangoli that is drawn on a daily basis goes under many names colloquially - door rangoli, daily kolam and daily rangoli being some of them. Obviously, since they are drawn daily almost all of them will be plain and simple too. In this series of door rangoli or rangoli that is drawn at the door or the main entrance some of the designs I practise or draw will be featured. I start with a free hand design that I usually draw and it possible to find a similar one in Rangoli sans dots with colours. It is a floral design with simple flower with some petal like patterns, surrounded by motifs as shown in the image. 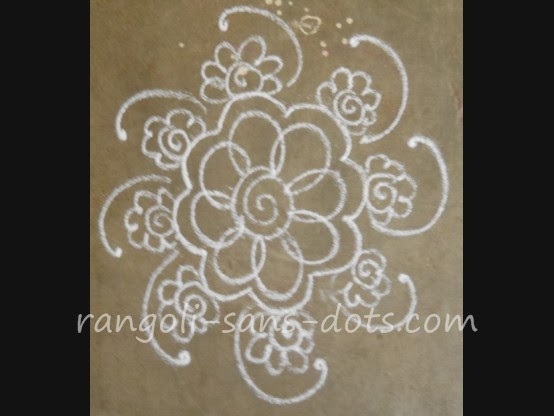 The second rangoli design is also quite popular among those who practise free hand rangoli. It is highly likely I have used or will use in the future a part of it or as whole (with colours ) in some of the rangoli designs. It is a cute design. Draw the intersecting curved lines that meet as shown. From the centre draw a bigger curved line and connect it to the one below with a 3 shaped curved line to get the motif. Repeat the steps and add any additional patterns as desired. 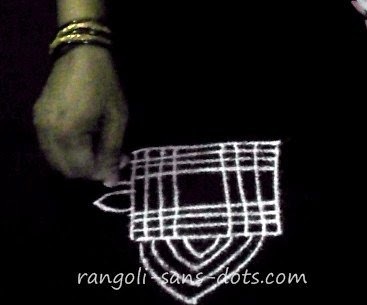 The next rangoli is a free hand, quite common and quite popular in rangoli-sans-dots. A basic floral or leaf design with 8 petals. Extended curved lines are drawn between them. Actually one curved line is drawn and the second appears to branch off from the first one. The intersecting straight lines drawn at first to start the rangoli, serve as the filament of the flower if you consider it a flower or midrib of a leaf if you think of it as a leaf ! The fourth rangoli after a few free hand rangoli is a rangoli that can be drawn free hand and with 4 by 4 dot template or pattern as is evident from the photo below. 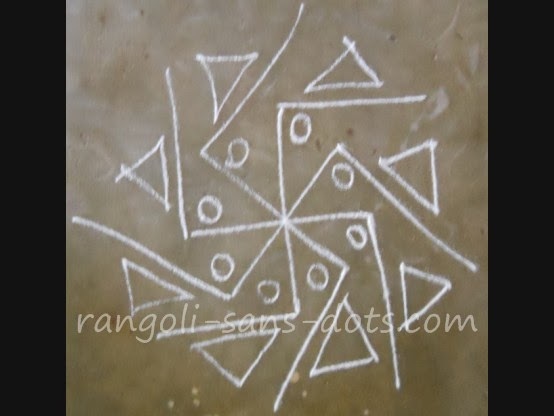 A few intersecting lines connecting the dots and few curved lines using up the remaining dots and we are through with this simple rangoli design. 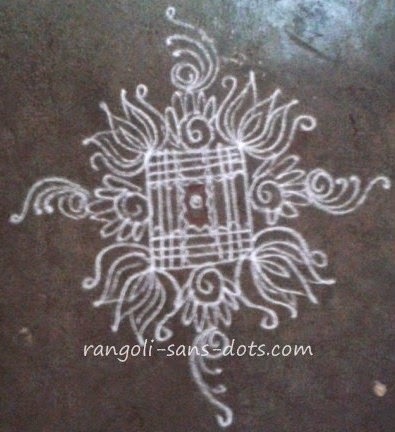 There are a few rangoli with 4 dots and 5 dots that may be suitable for doorways. 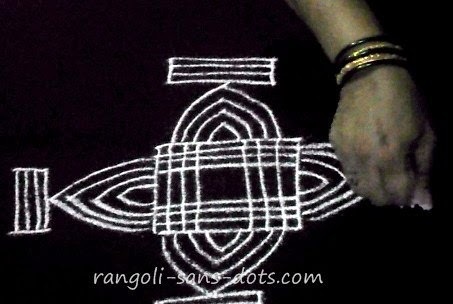 The fifthrangoli design, in the image is one of the simplest that can be drawn on a daily basis at the entrance or door. Have two swastiks one above the another. 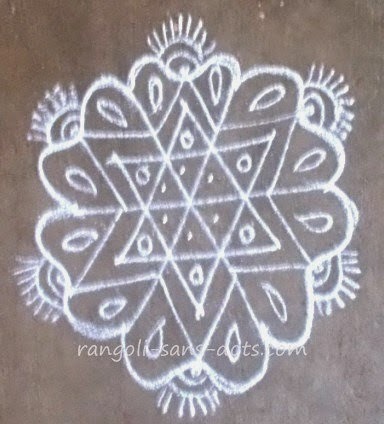 Some circular and triangular patterns are drawn as shown to get a simple daily rangoli design. The next rangoli is a free hand design that grows through circles, spiral patterns and curved lines and of course some geometric shapes. Ephemeral is an adjective associated with rangoli because it is erased daily or very short time. Rangoli that are drawn at the entrance of a house face problems from the elements of nature like wind and rains and from anyone who may inadvertently step on it. This rangoli faced this and a part of it got erased. That was drawn again by me as is evident from the image. The next rangoli in this series of simple - start with three elliptical designs (representing an atom ? ) and decorate the gaps between with motifs / patterns. This design can be done in very little time. Though simple when the right combination of patterns are added it becomes attractive. Add colours to make it more attractive and beautiful. This is the next rangoli in this special rangoli collection drawn at the entrance for festivals like Navratri. 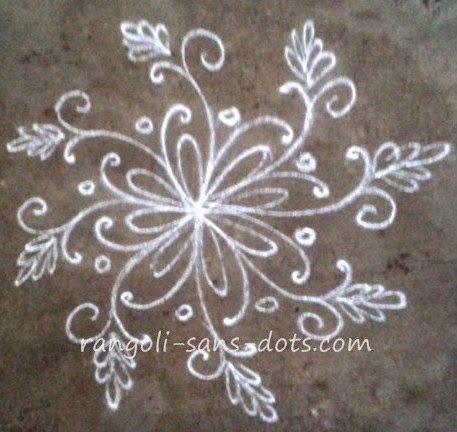 The floral pattern at the centre is quite popular in kolam or rangoli designs and so naturally in Rangoli-sans-dotstoo. Starting this is quite easy, draw the three intersecting lines at the centre. Connect the edges with semicircular patterns as shown. The border is decorated with mango designs (as they are called in Tamil ) probably they resemble simple Paisley motifs too. The remaining decorations are evident in the image and hence self-explanatory. The next rangoli - Draw a spiral design at the centre. Around the spiral pattern draw intersecting curved lines to get a floral pattern. Around the line drawn along the contour of the floral design draw more simple floral patterns as shown to get this rather simple rangoli. The f rangoli in the image is a free hand rangoli drawn with parallel lines, start with the three intersecting parallel lines ( an oxymoron says my son !) and evolve the rangoli design from there drawing floral petals and complete the design by connecting all the petals. The patterns drawn inside the rangoli are optional however they will make the design more attractive. 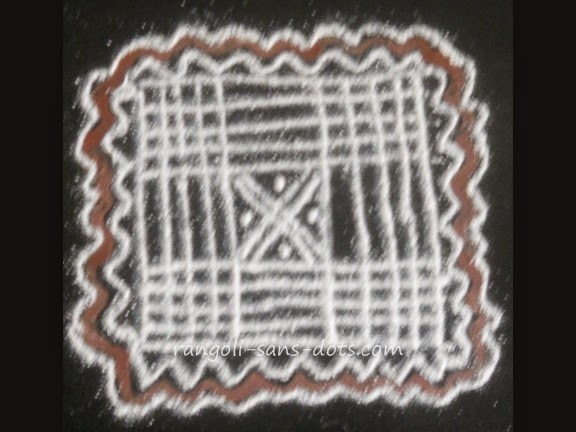 A kaavi (a red coloured sand powder ) border is usually drawn on Fridays. 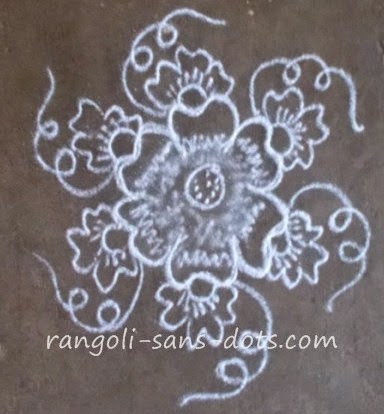 The next rangoli in this collection of daily rangoli - a term used for rangoli designs that are drawn on a daily basis. The central design can also be drawn with continuous curved lines but it is some what difficult. So The petals in the central pattern are drawn separately. Then they are all joined with curved lines to get this design As usual add a couple of curved line patterns around to get the final rangoli. 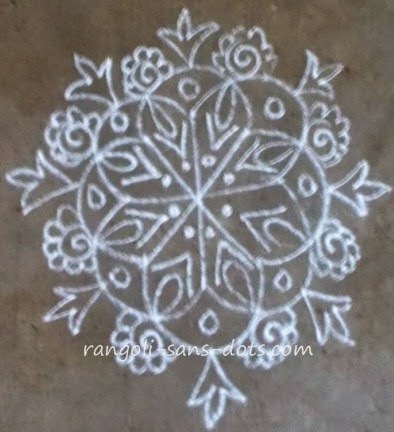 Another daily rangoli with circular or near circular designs the next one below. Starting from a small circle at the centre it expands through petals ( eight petals - actually you will observe it is easier to draw eight petals because sometimes four would appear to be less). The first four would face east, west, north and south. The next four between them would be north-east, north-west and so on. The border to match the inner design with curved lines is drawn to complete the design. 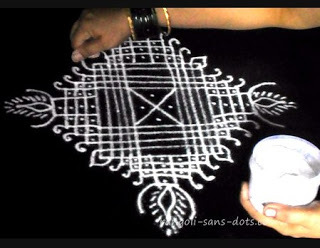 The next kolam in this series is a free hand kolam. Though the image is self-explanatory, just for the sake of record - A simple star formed with two inverted triangles has petal motifs on the six edges with simple diya designs as borders. The kolam is first drawn with a single white line. The second line is added later. Free hand kolam gives us the liberty to draw according to our imagination, the kolam may grow, expand or change even as we draw and imagine simultaneously. This kolam below is proof of how we can allow our imagination to run riot. 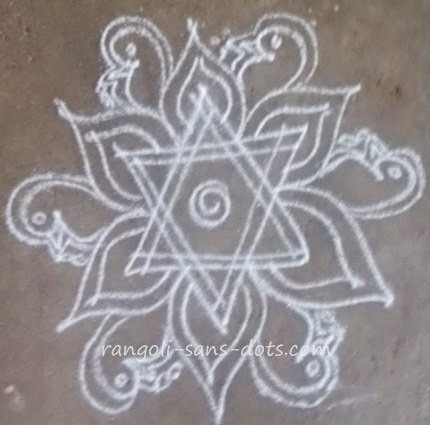 The previous kolam with star and petal pattern has been made more attractive with birds and fruits patterns added in the space between the petals.
. Start with the now famous (in Rangoli-sans-dots ) rhombus pattern. Draw four floral petals starting from one edge and terminating at the other edge. Now from the centre of each side draw a petal to the centre of the adjacent edge. Four such petals are drawn. The result is a floral design around a geometric shape. 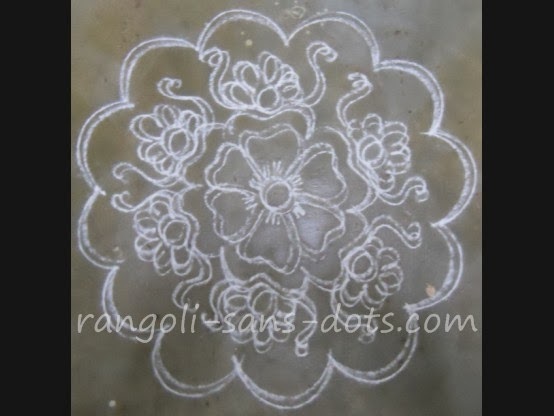 Add simple designs or patterns on this kolam according to your imagination. The pattern at the centre, a spiral design with dots around it is optional. However if it is absent, the kolam may look incomplete due to the blank area in the centre. The next kolam is a kolam with 5 dots, the dot pattern is 5 by 5. Use the 3 by 3 grid at the centre to draw the petals. Use up the remaining dots to draw the simple patterns and curved lines. There is no limit for the expansion and decoration of a rangoli. This is one more most post to show how we can generate ideas on free hand rangoli designs. Obviously, many are aware of this. 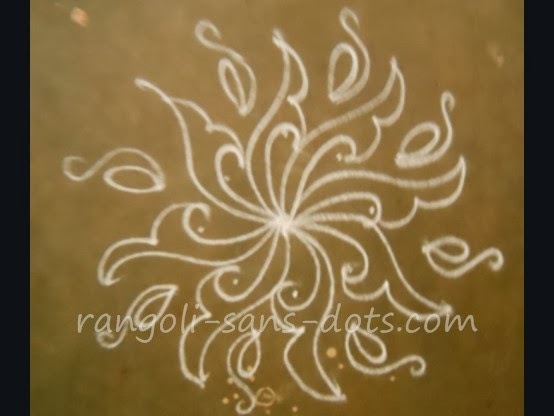 Since I feel that Rangoli-sans-dots should cater to the widest range possible, I have devoted a few posts and few rangolis to beginners or to those for whom rangoli is a new concept. Below, some maavilai kolam designs using a 5 by 3 dot grid. The basic pattern is the same only the decorations inside the leaves and outside can vary. Using a 5 dot grid - 5 to 3 dots we can achieve many beautiful kolam designs using our imaginations. Incidentally there are many 4 and 5 dot kolam in Rangolisansdots. After placing the dot grid form the star shaped pattern at the centre. The remaining dots are used to get six bird shaped designs. Add the crown and other designs inside the kolam. The same kolam with birds patterns drawn perpendicular to the lines instead of "parallel " to the lines . 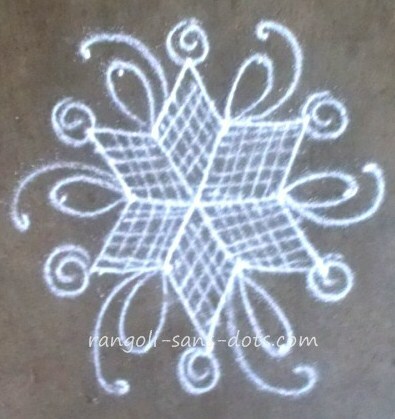 This kolam can be drawn with 5 dots or 7 dots. With 5 dots some free hand patterns will be part of the kolam. 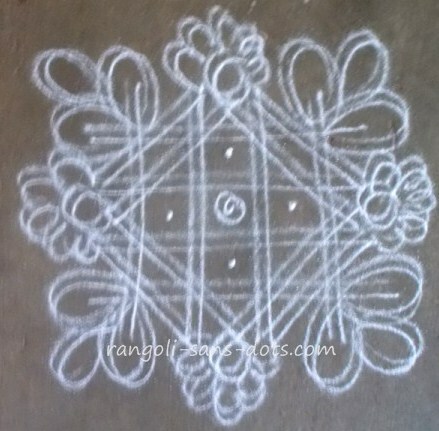 Double line kolam can also be drawn at the entrance with some practice. One simple design below. Drawing two separate lines without overlapping needs some practice and is one of the most beautiful aspects of kolam. The next one is a padi kolam with lotus at the four edges and free hand motifs added can be categorised under a naalu moolai kolam too. 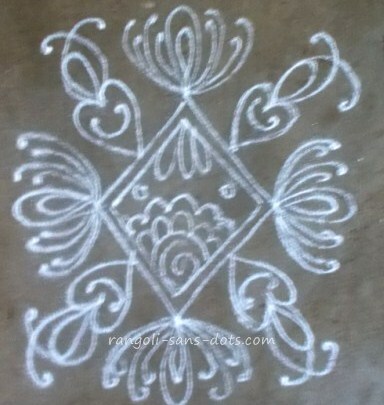 Padi kolam can be drawn on Fridays with a kaavi or red ochre colour border. It is easier to add colours to a two line kolam. Add colourful lines between the lines and the effect obtained is totally different. They are considered to be auspicious. It is believed that Goddess Lakshmi likes them very much. Though they are simple without decorations or colours, tradition has it that they are drawn for auspicious occasions. Since Rangoli-sans-dots is about rangoli without dots, primarily, posting of such designs is to show the wide variety of designs that are available to us as also because of the importance accorded to this type for marriages and other such functions (in Tamil Nadu, I hope it so in many other parts also ). They are popular in southern India. 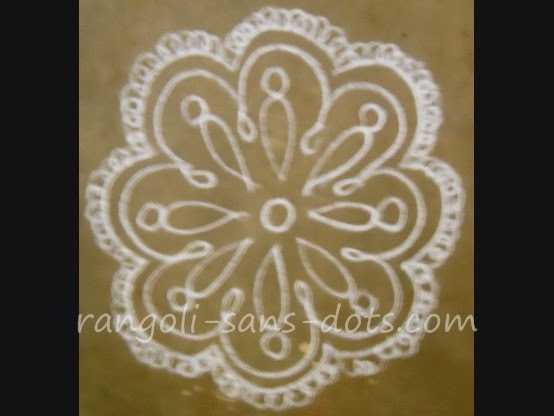 These rangolis have a kaavi ( a red colour powder) border on the periphery. They are also free hand type. 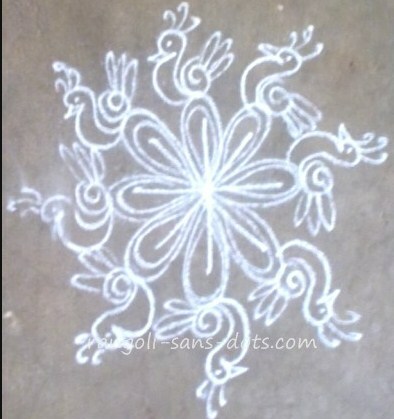 Many designs are possible They are called padi kolam in Tamil. 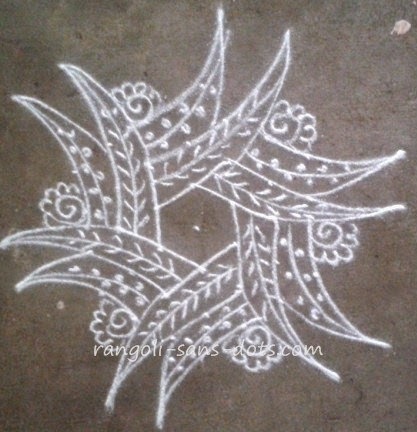 These designs are simple with number of parallel and perpendicular lines drawn to create a rangoli, usually. The first one above is the simplest of them all. Few lines at the top and few lines at the bottom. Similarly the same number of lines on the left and then on the right. The square formed at the centre is filled with some simple designs. 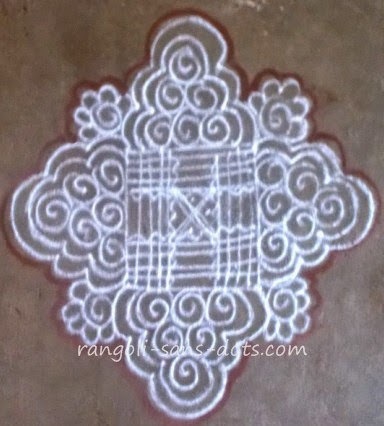 All rangolis are invariably surrounded by a pair of lines in white with a kaavi or brown border between them. I do not know when or how they came into existence. Also how, when and why they became auspicious or considered to be auspicious is not known (to me). Probably they were the earliest designs drawn because colours are not added to them. If some one has authentic information please throw light on this issue. 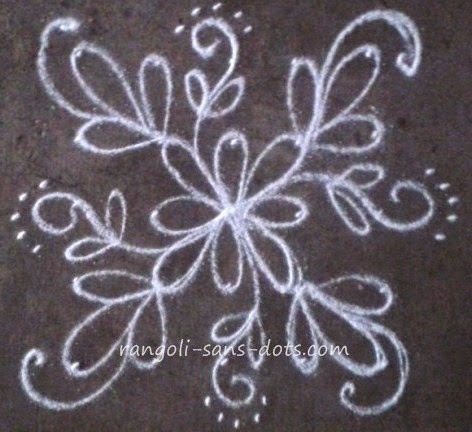 They are also called manai kolam in Tamil because similar designs are drawn on manai - a low wooden seat. These seats are used in house warming ceremonies, marriages on which the person or persons performing the auspicious act sit cross legged. The manai or wooden seat is decorated traditional rangoli designs and hence the name manai kolam. The two photos are among the simplest naalu moolai kolam, the first one with the basic pattern only. 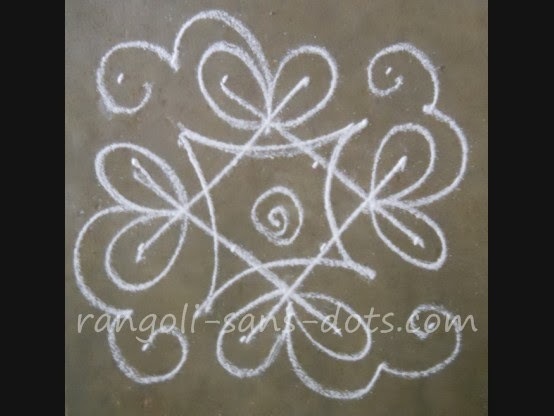 The second one is an improvement of the first rangoli with four simple spiral patterns on the sides with a simple flower-like pattern around the spiral ones. 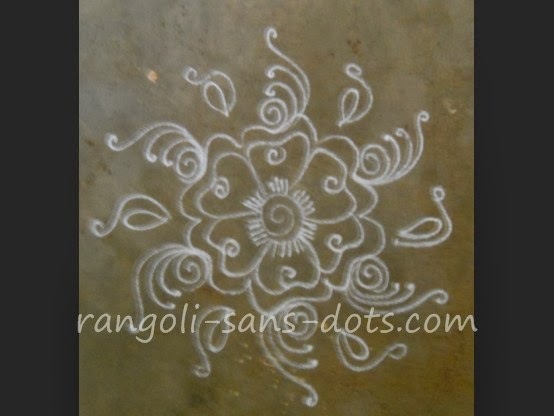 These rangoli can be very attractive when drawn with more lines and of bigger designs. 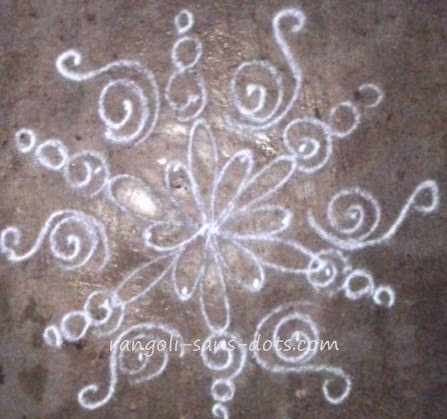 This is a simple padi kolam with lines and spirals and since it is a Friday a kaavi border around it. Like free hand kolam we can go on expanding padi kolam designs using patterns formed with only lines. 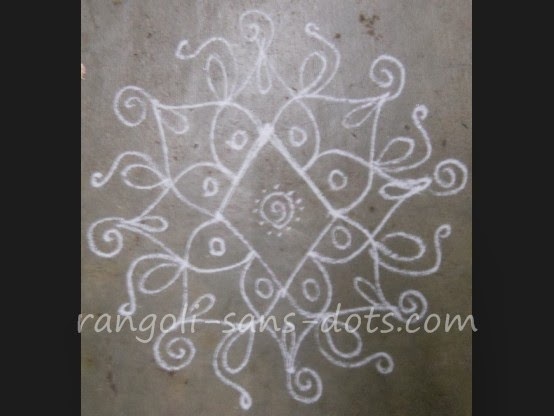 However, as has been and will be the theme is Rangolisansdots most kolam designs will be simple. 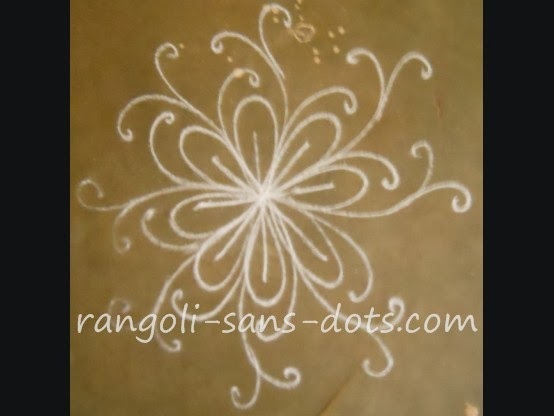 So one more simple padi kolam design adorns Rangolisansdots. Padi kolam can be drawn at the entrance on Friday during the week apart from festivals and functions. 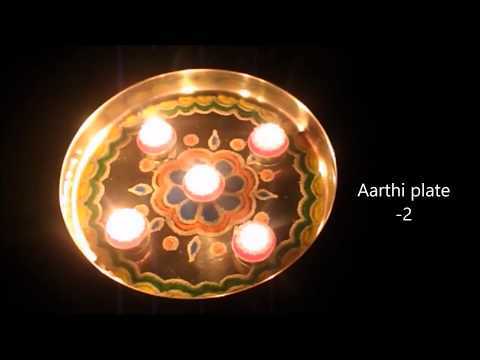 A simple padi kolam with images showing the intermediate steps. 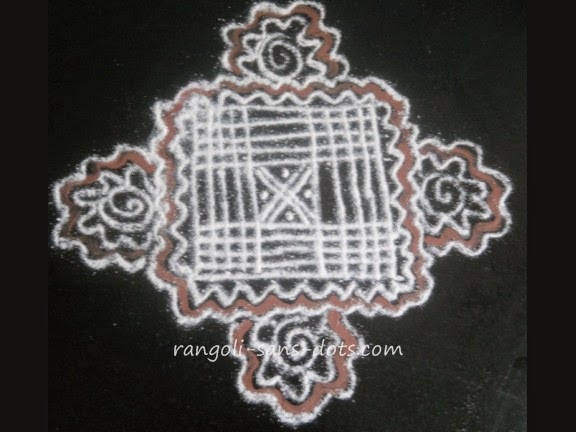 It is preferred that padi kolam start with a square pattern at the centre. From there we can add more patterns to get a design. In this kolam I have used paisley or mango patterns on the four sides and hence it may be categorised as naalu moolai kolam too.
. The padi kolam above has a number of parallel and perpendicular lines used to form the pattern shown above. All the lines are drawn free hand with white rangoli powder or rice flour paste. Then the design is further enhanced with more designs like inclined lines or curves or motifs. The entire rangoli is decorated with kaavi powder (red ochre powder). 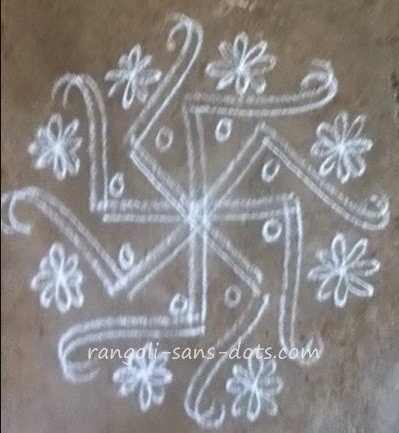 Traditional rangolis should invariably have a kaavi border. They are considered to be auspicious and drawn at the entrance for auspicious occasions and festivals like Navaratri, Varalakshmi vrata. This has already been emphasized in an earlier post. The first one is a common type with number of parallel and perpendicular lines drawn to form the design. The second has a simple padi kolam for basic design surrounded by four lotuses because lotus is associated with auspicious functions and has a religious and auspicious connotation. The remaining areas are filled with patterns similar to conch. That is also considered lucky and has religious significance. 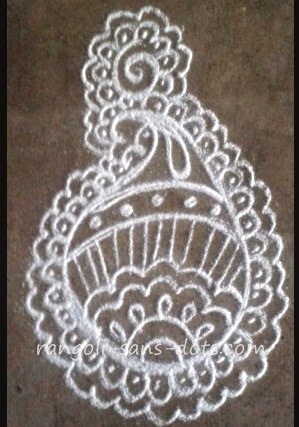 A simple yet nice traditional rangoli. The next one is also drawn using lotus like patterns. It has four lotuses on the four sides . It also has some patterns between the lotuses and also on top of each one. 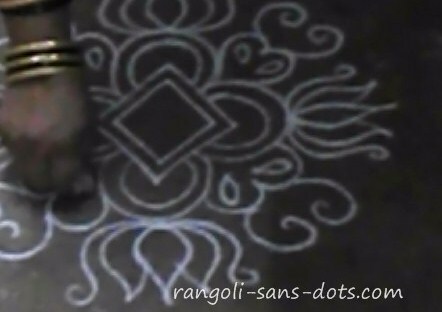 It is rangoli sans dots and so there is some influence of free hand designs in what ever I draw. It is just a variation I tried to make the first padi kolam more attractive. I hope I have succeeded. I have been trying something different (at least for me - it is possible that what I am trying has already been used or tried some where!). Padi kolam another category of rangoli designs that invariably use a lot of straight lines, curved lines and circles and is called padi kolam in Tamil ( padi literally means step ). 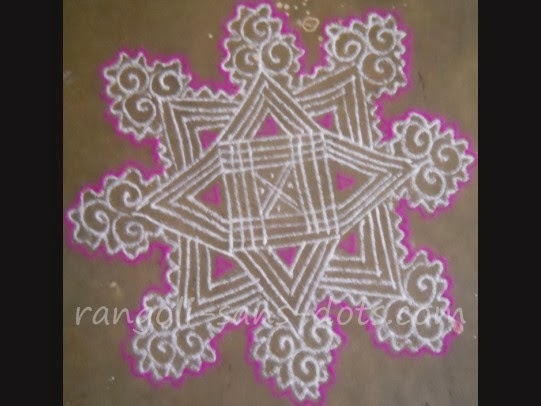 It is a traditional variety of rangoli that are invariably drawn with white rangoli powder and decorated with kaavi border ( a red coloured powder probably something like red ochre ). In this case I have decorated with pink colour. I have tried some designs with colour rangoli and with additional free hand designs around them with some rangoli borders for Ugadi. The basic idea is the same i.e padi kolams drawn with mostly, straight lines, I have tried some thing different. An important aspect of significance of kolam or rangoli drawn at the entrance of houses is that when this kolam with a red ochre (kaavi border ) is drawn at the entrance it can be understood that a function like house warming , baby showers is being celebrated in the house. Also, can be drawn for Puratasi month ( Tamil month that falls between the second week of September and third week of October. The maavilai kolam can be drawn with 7 by 4 dot grid . The next kolam can be drawn with 5 by 5 dot grid. 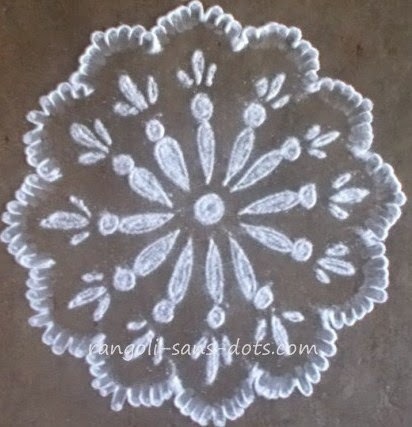 Using simple patterns we can get a simple yet beautiful kolam. Placing of dots around the kolam is one of the trademarks of my mother. The next kolam drawn by me at the entrance under this category of apartment kolam because I invariably draw small designs at the entrance, most of them rangoli without dots ( it is rangoli-sans-dots !) and an occasional kolam with dots. In my opinion many of the kolam designs with dots can be drawn without dots and similarly kolam with dots can be fitted in a dot grid depending upon the complexity of the pattern. For complex and intricate patterns we can draw some patterns free hand around the kolam drawn with a dot grid. So, this kolam drawn without dots can also fit into a dot grid, you may probably 'discover' this kolam with dots elsewhere in Rangoli-sans-dots! The kolam has a six petal twin lobed floral design at the centre with floral patterns adorning each petal along with creeper tendrils like motifs. The centre has been decorated with white rangoli sprinkled to make it more naturalistic (!). Another free hand kolam for entrance. Draw a number of straight lines extended at the top as shown. Draw alternate spiral and lamp motifs as shown. It is a simple but beautiful design. Colours can be added and the lamp decorated further for festivals like Karthigai. The next kolam ( on the right ) I drew on a Monday, the first day of the week. 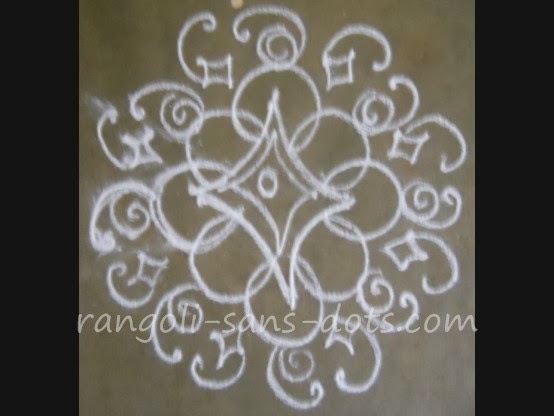 To begin the week a free hand kolam at the entrance with lines and arcs as the basic design with other patterns as shown to decorate the plain kolam. The kolam design above is using a 7 by 4 idukku pulli dot grid. Draw the central floral and hexagon patterns and connect the remaining dots as shown through a spiral pattern. We can add a border around the kolam also. The kolam on the right is another free hand kolam with with spiral pattern at the centre with spiral patterns all around ( this is also quite common in kolam and in Rangolisansdots ) with floral patterns all around with curlicues as shown. For a change, I tried this mehandi rangolli design with paisley patterns at the entrance. Drawing a paisley pattern in at a single stretch is difficult, we can complete in two stages. 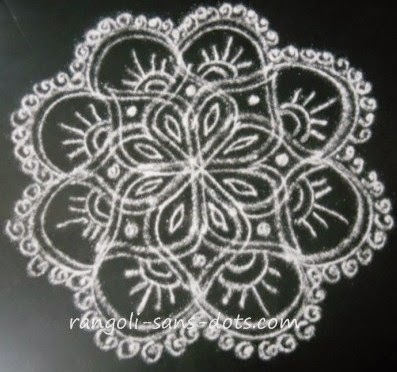 One of the features of drawing a kolam with thin lines is that when the kolam is erased for drawing a new one , the kolapodi retrieved will be less than spoonful ! The floral motifs on a flower design inside with flower border with floral petals on the top. 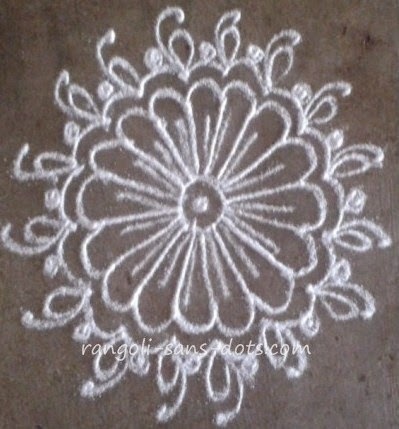 It is raining flowers in this kolam design I drew on a Wednesday at my entrance. Flats or apartments demand small designs both for daily use and for festivals. 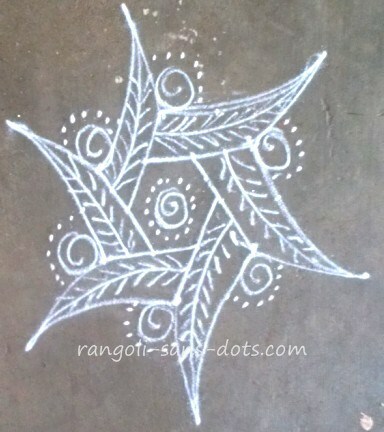 The basic star design is adopted in many a rangoli design. Using such common designs ensures that we do not have a starting problem (!) when we commence drawing a rangoli. From these common patterns we can develop according to imagination. 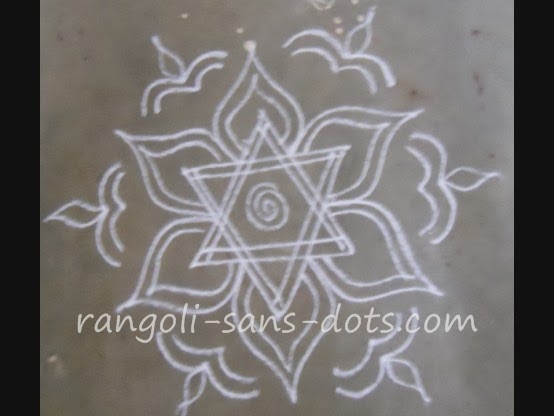 Using the basic star design I have drawn a simple kolam or rangoli shown in the image above. I prefer free hand rangoli or small rangoli with dots at the entrance . 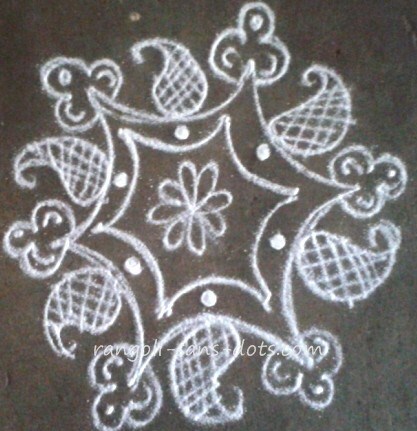 You would have noticed that I use sikku kolam infrequently because my mother taught me that sikku kolam should be used rarely at the entrance. 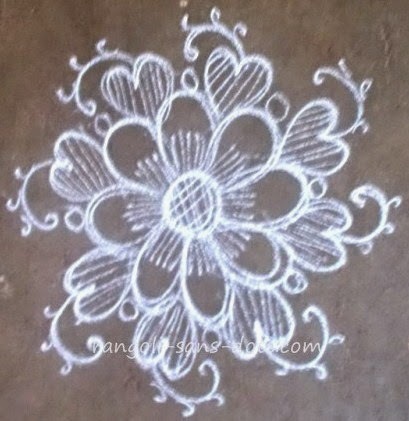 Small kolam designs are also required due to lack of space and lack of time due to our fast paced lives. However , these factors should not hinder us from practising this beautiful art that is part of our culture. 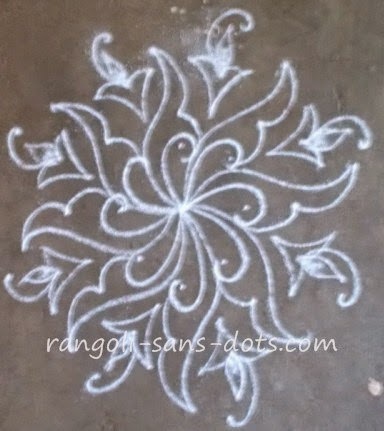 The kolam in the picture above is one of the many designs I have tried for Rangolisansdots and the entrance of my house. The central design is based on a popular video from my Channel. Draw the straight lines horizontal and vertical to get the pattern as shown. Usually I stop with the two floral petals on the four corners. 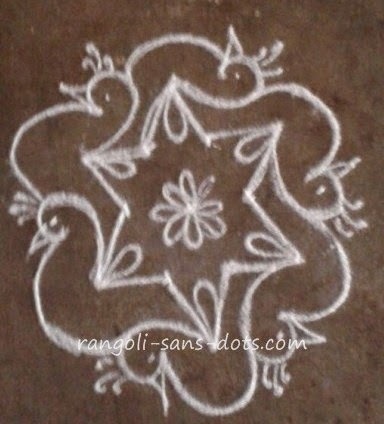 In this kolam I have tried some cute bird designs that appear to perch on the petals. If we are confident we can add one more line to get a double layered appearance. 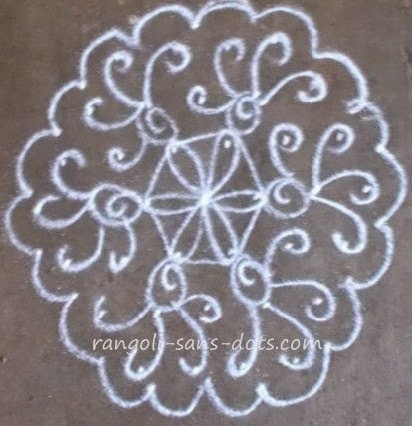 Though simple and small this kolam when drawn at the entrance will definitely attract the attention of your neighbours. Also called kutty rangoli kolam designs by some , these small and cute kolam are a must for decorating our house. Proceed to view more kutty kolangal ! 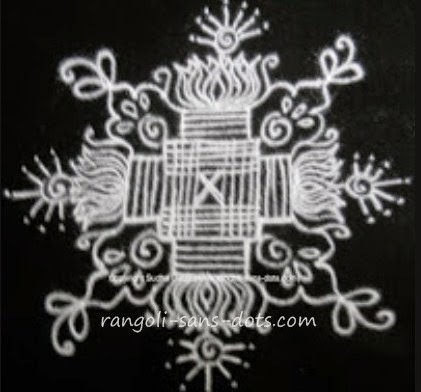 The next kolam drawn on a Wednesday, is some what similar to the one above and is also one of my favourite kolam designs. This kolam is already there in Rangolisansdots. 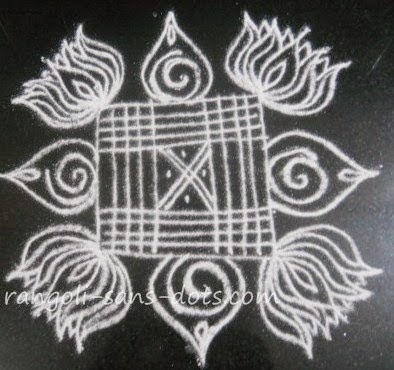 This can be thought of version 2.0 of the original kolam because I have made it a two line kolam with decorations inside and on the four corners. 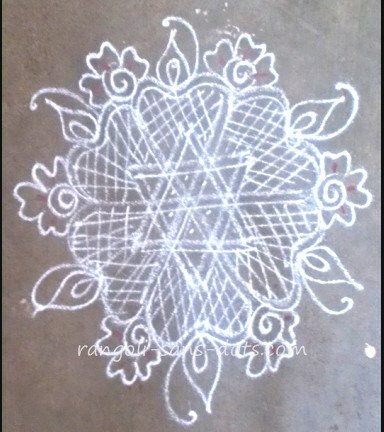 After some free hand kolam designs, this kolam I drew on (a ) Thursday, at the entrance. The dot pattern is 5 by 5 and the patterns are butterflies. The bottom portion of the butterflies may either represent wings or appear as if the butterfly is sitting on a flower. We may also add more free hand patterns in the remaining gaps as shown. Now the antennae will be outside the dot grid and drawn free hand. Saving rangoli from the vagaries of nature or man even till I take the photo after drawing is occasionally becoming difficult. So I had to draw again the erased portions of the kolam. The kolam below drawn at the entrance has lotus patterns as theme. So four lotus like patterns at the centre and four lotus like patterns as the border for threshold. As with many rangoli designs the central portion of the kolam can be drawn with a small dot grid too. The next kolam I have drawn on a Thursday. I have chosen this parallel kolam randomly. Incidentally there is a concept called kizhamai kolam with specific kolam being drawn on Monday, Tuesday, Wednesday etc. I am not aware of it. What I know is that for Fridays kolam like Hridaya kamalam and Aishwarya Kolam are drawn in the Puja room. They are Vellikizhami kolam. So far as other days of the week are concerned I do not know about specific kolam for the day. 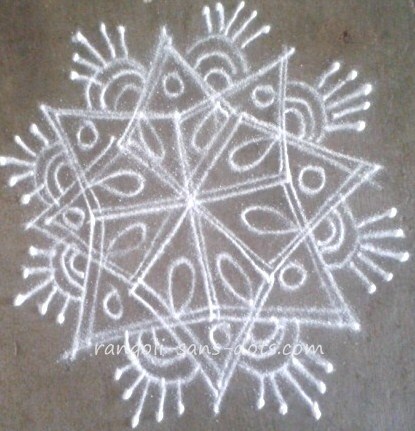 The next kolam drawn on a Wednesday after Akshaya Tritiya is a simple yet different kolam. Though the kolam is different this method is quite common. We have to draw some basic patterns for the kolam fill the gaps with kolapodi as shown in the image. Then we have to draw a thick outer border to match the contours. Using the index finger we should push the kolapodi border outward to get a different effect for the kolam. 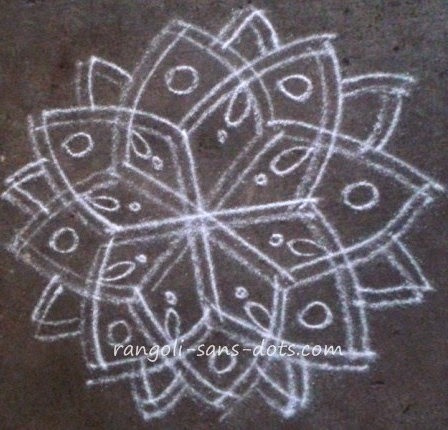 This kolam was drawn the previous day also but the newspaper delivery at my house ensured that the kolam was erased. The result the previous day's kolam did not even last the time it took me to draw the kolam. The next kolam below was drawn on a Sunday. One more free hand kolam with some common patterns. 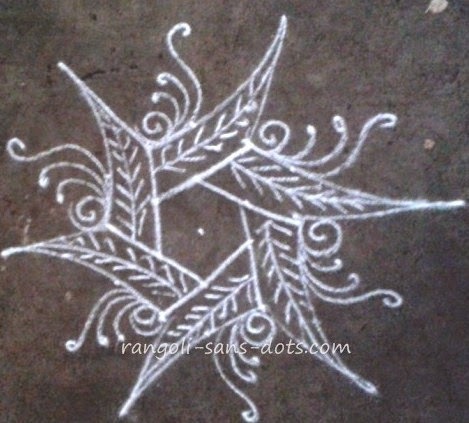 The only thing unique about this kolam is that some kolam podi was placed on the tips of the lines that are supposed to be the main veins of the leaves . 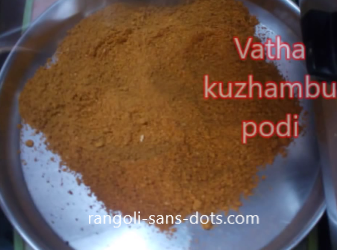 The kolam podi was then pressed with the index finger to make the dots appear more pronounced. 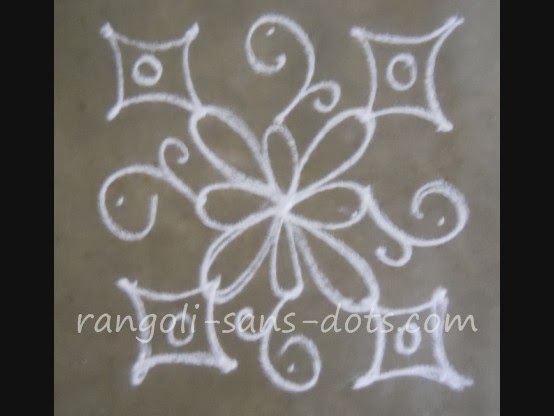 This is quite a common method of decorating kolam. It is unique to this kolam and not unique by itself. 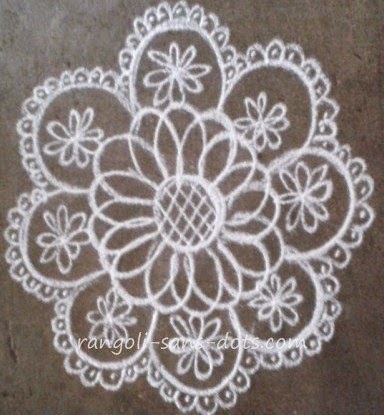 Sunday may be a holiday but Sunday or any other day my kolam designs have been invariably simple. This kolam was drawn the next day - on Wednesday. Usually I draw the kolam early in the morning ( vaikkarai pozhudhu as we say in Tamil ). 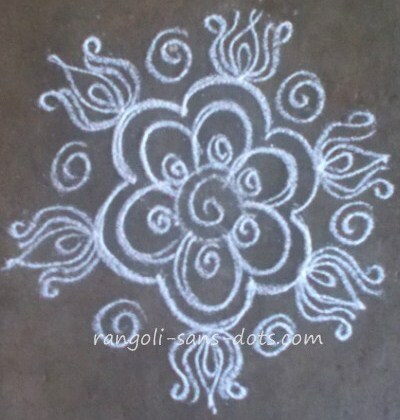 This is also a free hand kolam with the now common ( in Rangolisansdots ) spiral patterns. The floral patterns have been decorated with a number of thin lines intersecting ( thin lines are called ezhai in Tamil and kolam with thin lines are called ezhai kolam - this type of kolam is practiced or drawn during functions when we draw padi kolam designs. This is a floral design kolam with heart shaped patterns between two petals. I have added ezhai or lines from the centre of the flower to represent some striations on petals that are seen in some flowers. Similar ezhai or striations on the heart shaped patterns is possible because the ezhai will be congruous with the flower. 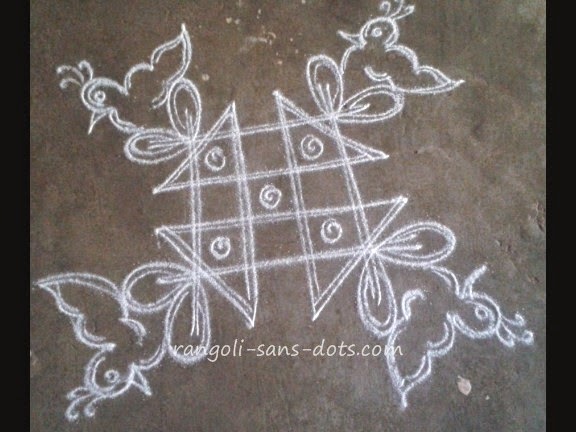 ther free hand kolam for the entrance of flats or any other house. As has been with many kolam designs I have shared, this is also small and simple with floral petals and leaves. I have added tendril like patterns too. Flowers, leaves and tendrils go well together and all will look in place. 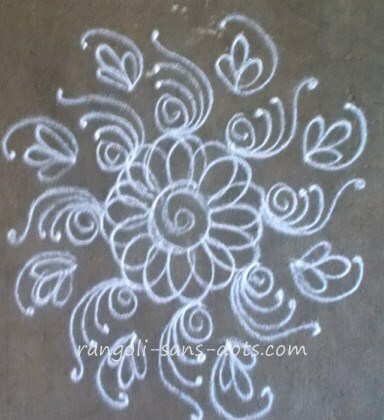 One more free hand kolam and as usual small and simple drawn on a Tuesday at the entrance of my house. This is inspired by the weather vane or wind vane on which we find a bird perched on the top. This kolam has been drawn with the central pattern retraced again with kola podi over the original design to get a double layered effect. Another free hand kolam drawn on Friday using the same star shaped central design with double storkes. I have changed the next layer of patterns forming floral petals from the points of intersection of the central pattern resulting in bigger floral petals ( compare with the previous kolam where the floral petal like designs form the third layer. 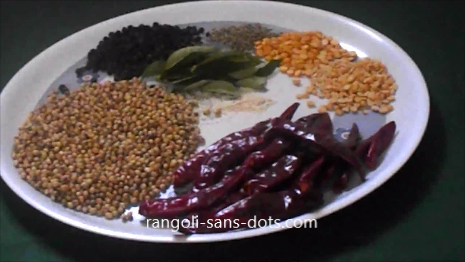 I have also added a number of thin lines or ezhai as we call them in Tamil. A few touches with kaavi to mark that this kolam is for Friday are there in the outer most petals. 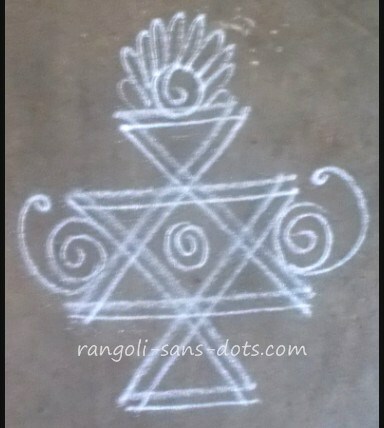 This kolam I drew on a Sunday of course spontaneous design as free hand kolam usually are. Four lotus patterns on the four edges of the rhombus. 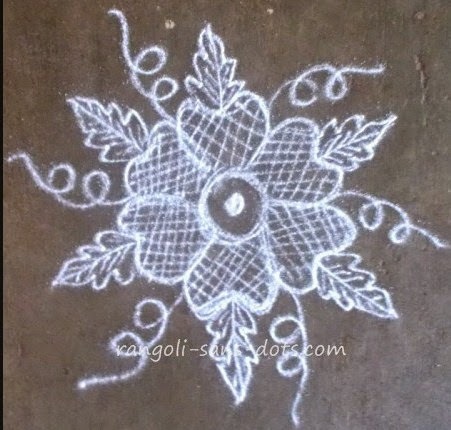 May be this is a simple kolam and so can be tried on a dot grid too. Two of the latest addition to this collection of simple kolam that I draw at the entrance of my house. Both have been drawn free hand and can be drawn using a dot grid too. The first one uses six paisley designs while the second one has a pair of lines drawn separately to form some patterns inside and outside which simple decorations are there. Margazhi is a season for bright, big and colourful kolam. 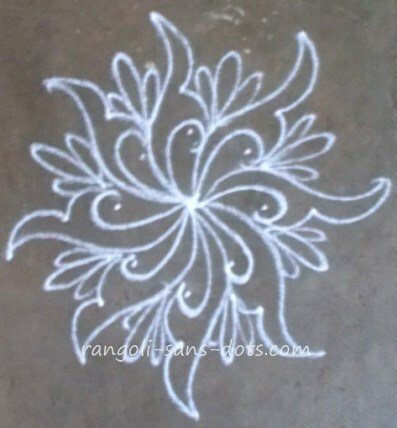 There are hundreds of kolam in this variety in Rangolisansdots. 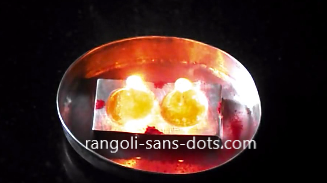 Rangolisansdots as the name suggests should have rangoli without dots. 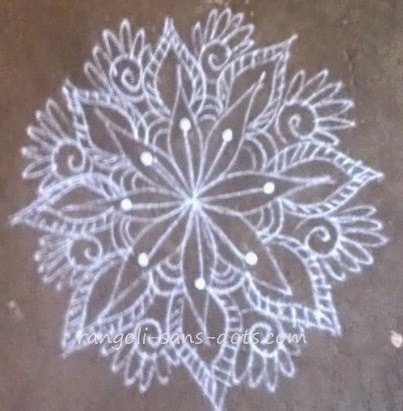 So some of the simple kolam/ muggulu without dots without colours are shared here These are some of the simple designs I draw at the entrance. 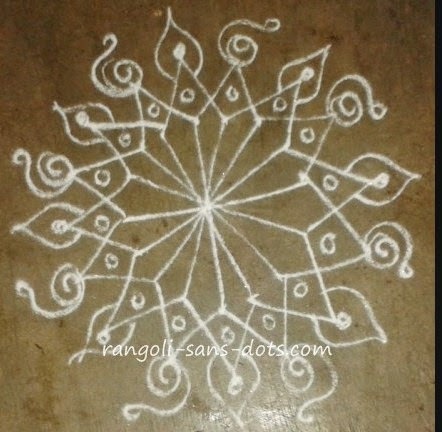 So I would like to share some simple kolam with or without colours, with or without dots that may be useful to those who favour simple and small kolam during this season for kolam. 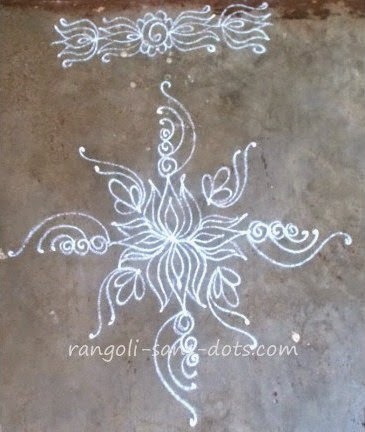 This kolam is drawn free hand , after all it is Rangolisansdots ! The central floral pattern is drawn with a number of overlapping petals around a spiral pattern , these petals can be drawn continuously with some practice. 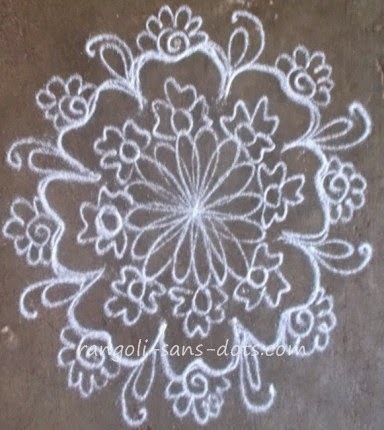 Around these petals motifs that are quite common in kolam designs are drawn in two layers. he central floral pattern can be and is drawn in a continuous stretch. The kolam below drawn on a Tuesday can be drawn with a dot pattern also but I have drawn it free hand. 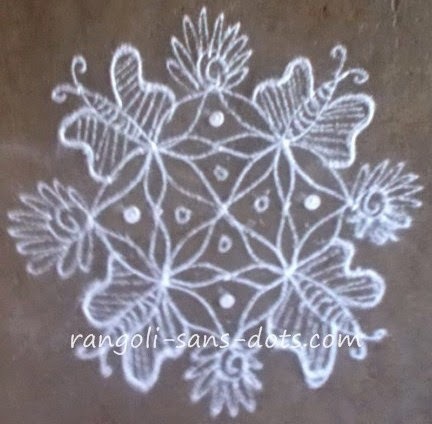 As I have written already rangoli-sans-dots can become rangoli-with-dots and vice versa in most simple designs. The outer border of the floral pattern kolam has been decorated with dots ( a common decoration in free hand kolam ). The kolam on the top decorated the entrance of our house on a Monday morning. I hope that the designs in this category uploaded may be similar but not the same. I think there must be more than 25 kolam designs so far. 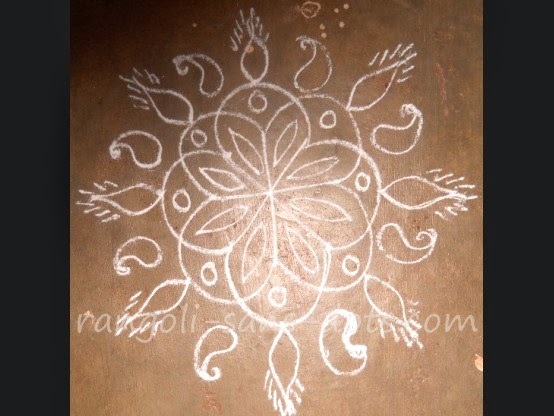 So far as the kolam is concerned a floral design with 16 petals decorated with motifs outside as shown. If kolam itself is an ephemeral art, the passers by including the person who delivers the newspapers make it even more so , so I had to rush to take the photo of this kolam. 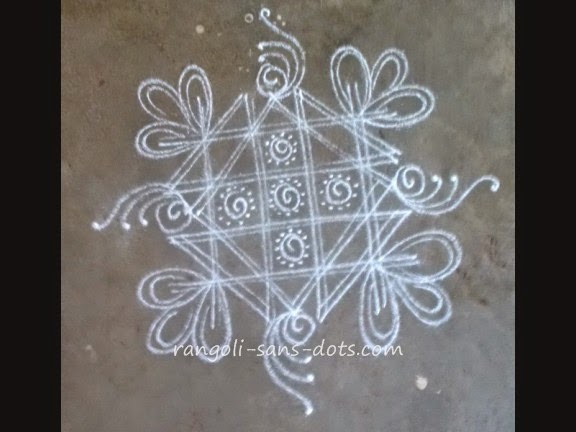 kolam / muggu without dots and without colours are thoses designs that are practically in practice ! We invariably draw these type of designs as a part of our daily routine . The next muggulu design that is plain and simple in the image below. Actually this muggu can be drawn as free hand muggu or as one with dots. This one appears to be a combination of both. The dots that are visible can be used to covert the muggu into one with birds designs. 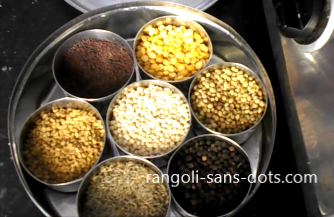 Recently my elder sister went through Rangoli-sans-dots and said a few nice things about it. I know she doesn't do it because I am her sister. I was elated because her opinion, if it is not straight from the horse's mouth it is the next thing to it. Of course she also gave some suggestions on how and where to improve. I am trying to implement them . It has been few weeks since rangoli designs have started 'appearing' in Rangoli-sans-dots and many different types have been covered. Hence it is time again to give a round up of some of the topics and types covered so that it would be useful for reference. I have or will cover the methods of drawing using rangoli powder. 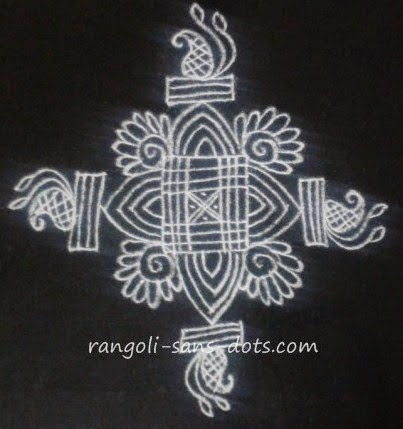 The simple single line rangoli design and the double line or two line rangoli that is somewhat more difficult than the single line type. 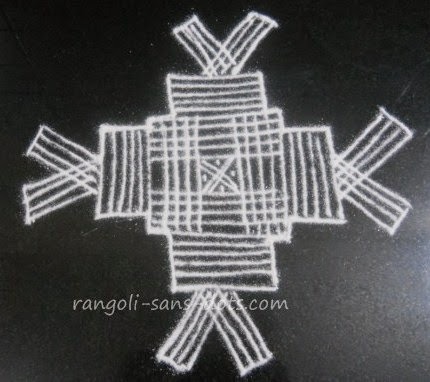 Rangoli with three parallel lines are also possible ! 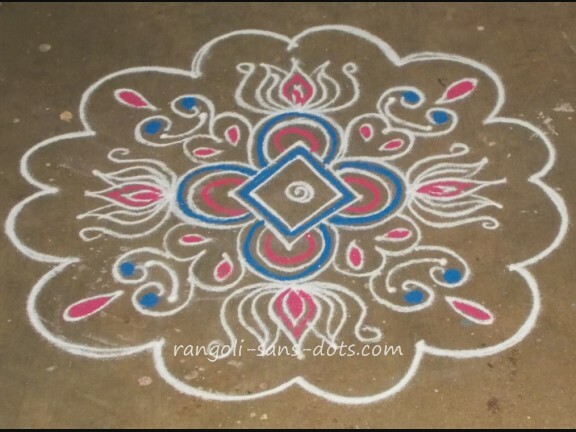 So are rangoli or kolam with two lines of different colours. So far Rangolisansdots has a modest collection of rangoli designs.